Hey everyone! Happy Wednesday. Today is my day to post over at SVG Cutting Files. I have an adorable new file to share with you! 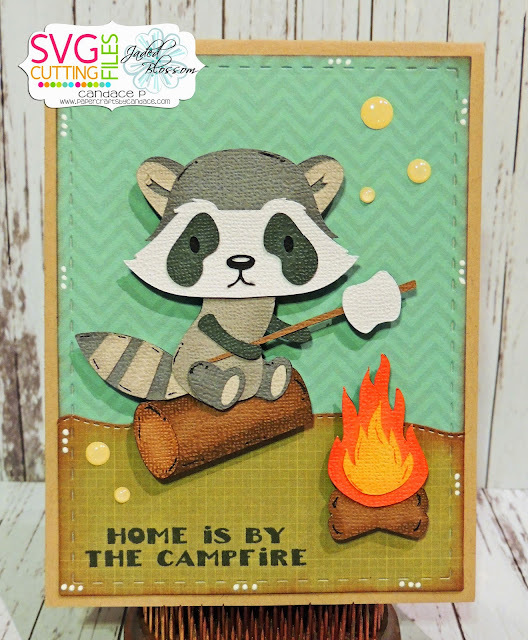 This Raccoon marshmallow file will be available Friday! It also comes with the campfire. From Jaded Blossom I used Card Mat Dies, Tropical Dies, and the new "The Great Outdoors" stamp set. Aaaaaw, your little raccoon is adorable! Cute papers and fun sentiment Candace! OMG What a super cute card...Your Raccoon is so precious and this would be great on a LO too. You totally did one super outstanding creative job. I'm totally stoked with your card. Jaded Blossom's Monthly Challenge: Go Wild!